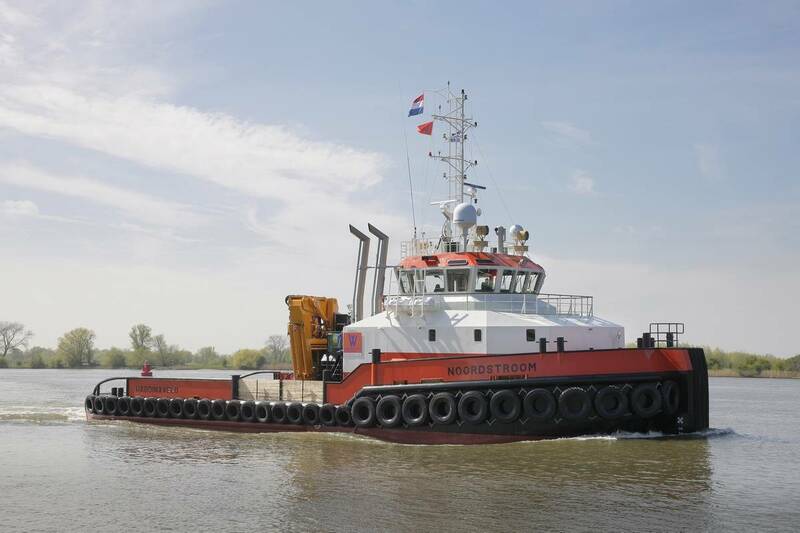 The first of Damen’s new Shoalbuster 3512 class was recently handed over to Dutch marine services specialist Van Wijngaarden Marine Services B.V. in the port of Boven-Hardinxveld, the Netherlands. At the ceremony the Lady Sponsor Elske de Bruijn-de Vries officially named the vessel and made a speech praising the technical capabilities of the vessel. Elske de Bruijn-de Vries is the wife of C.A. (Niels) de Bruijn, a member of the executive board of Van Oord, and is well-known for her role in the TV show ‘Het mooiste meisje van de klas’. At 35 meters in length the 3512 is the largest Shoalbuster built to date, yet with a draught of just 2.9 meters it has unrivalled shallow waters capability. Work began on designing the vessel at Damen Shipyards Hardinxveld in February 2015, with the objective of delivering a multipurpose workboat capable of undertaking a range of roles including towing, mooring, pushing, anchor handling, dredge support, supplying and other support roles. 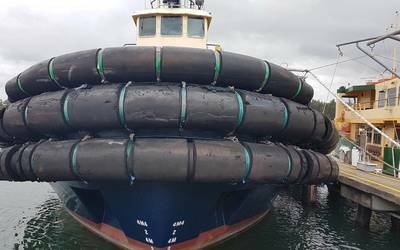 Damen said its Shoalbuster range is known for being versatile, capable of handling tasks ranging from short and long distance towing to support for offshore projects such as the construction and maintenance of windfarms. The 3512, with a bollard pull of 56 metric tons, a deck area totaling 145 square meters; enough space for seven 20 foot and two 10 foot containers, and an 11.3metric tons 16.5 meter deck crane, extends that reputation even further. The Noordstroom is the fifth Damen vessel to join the 14-strong Van Wijngaarden fleet. The first was a secondhand Damen Pushy Cat 42 bought over forty years ago and which is still in active service today. That was followed by three Shoalbusters; one 2609S and two of the 3009 class, and they, along with the other vessels in the fleet, are deployed all over the world. As an illustration of just how flexible the Noordstroom is, as well as her regular equipment she can be fitted with a range of auxiliary modules when needed, including a 50-metric-ton A-frame with a plough for seabed leveling, a four-point mooring system, an ROV platform and a diving operations platform. The Noordstroom is equipped with tanks capable of storing 255 cubic meters of fuel oil and 43 cubic meters of fresh water. Other features include a fresh water maker, a sewage treatment plant and a moonpool (Netto: 700 x 600 mm). The propulsion system of the Noordstroom is powered by three 970 kW Caterpillar C32 ACERT 4-stroke diesel marine engines delivering a total of 2,910 bkW at 1,800rpm. The middle engine is configured with a generator to supply electrical power to the hydraulic deck gear including the crane and winch, as well as the bow thruster. Each engine also has a Reintjes reverse reduction gearbox with built-in hydraulically-operated clutch, and drives a Promarin fixed pitch propeller in a Van der Giessen Optima Nozzle. There is also a 300 bhp electrically-driven bow thruster. The two Caterpillar C7.1 main generators on board the vessel generate 187.5 kVA of power each. In addition, one 600 EkW emergency power generator coupled to the centre C32 main engine has been fitted. Other auxiliary equipment include transfer pumps for freshwater and fuel oil, a Westfalia OTC-2 fuel oil separator, and an electrically-driven hydraulic set with two E-motors of 110 kW and 52 kW respectively. The navigation and communication equipment on-board the Noordstroom is tailored to the requirements of global trade. The Noordstroom accommodation provides heated and air-conditioned living spaces, including a captain's cabin, two single crew cabins, four double crew cabins, a galley, a mess, and sanitary facilities. There is even an office for the client, complete with V-SAT connection. The facilities comply with ILO2006 rules, and can take up to 11 persons. The Noordstroom is classed by Bureau Veritas: I # HULL •Mach, Tug Unrestricted navigation • AUT-UMS, with an Anchor Handling notation and sustainable practices onboard resulting in a ‘Clean Ship Notation’ conforming to the IMO’s ‘Green Passport’ regulations.